Giving is always better than receiving. That’s the inspiration behind Charity Panda, a website you can use to raise funds for your favorite charities. Make giving part of your next celebration: a child’s birthday party, a holiday gathering, a dinner party, or any other memorable milestone event. With Charity Panda, it’s easy: You invite guests to your event and ask them to donate to your chosen charity in lieu of gifts. Their donations will be tax deductible, and Charity Panda takes care of everything electronically– from personalized invitations and reminders to thank you notes. To learn more, visit www.charitypanda.com — and plan some FUNraising today! We provide exceptional parent-and-me style gym classes, concert-style music classes, a Kidville University preschool alternative program, birthday parties, and drop-off events. At JW Tumbles Rye Brook, nurture each child’s natural curiosity and desire to learn though play. Our unique programs help build upon social and developmental skills in a confident and comfortable environment. As you watch your child develop a more confident, capable mind and body, you’ll understand why JW Tumbles truly is “a learning playground”. Visit our site here or call us at 914-251-0555. Making Faces Parties with Margie Nugent. Host the very best in Birthday Parties and include Making Faces for optimal fun! 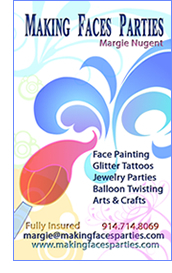 Face Painting, Glitter Tattoos, Jewelry Parties, Balloon Twisting, and Arts & Crafts. Contact us for more information or to book your party! Telephone: 914.714.8069, Email: margie@makingfacesparties.com. Visit www.makingfacesparties.com. Give a unique gift to all your guests on your child’s special day. ArtSmart will come to your house or party facility with all the materials necessary to create a masterpiece to enjoy for years to come. Children will take home a famous artwork they created! Not your average goody bag! Choose your favorite: Picasso, Monet, Warhol, Van Gogh, O’Keefe, Degas, Cezanne & many more. Don’t forget the music! Your event can be tailored to include our Feeling Groovy Music/Movement. Children will sing, dance and make beautiful music together! Call Patti for more details at (646)234-5995 or visit www.nyartsmart.com. Let Mystery & Mayhem spice up your next event with an interactive mystery that is as extraordinary and hilarious as it is unpredictable! Hailed by Quest Magazine as “The Best of New York” we’ve been stimulating and delighting the inner sleuths and thespians of kids since 1988. “Mystery & Mayhem parties have become the most anxiously anticipated social event of the school season!” – Angelica Sigalos-Nelson, Forest Hills, NY (Mystery parties for her three girls, aged, 8, 10 and 12 and treasure hunt for her 5 year old son). Visit www.mysteryandmayhem.com or call us at 212-260-2295. * Take the kids on a train “adventure”– get on at a stop near you and take the train to another stop — research the surrounding area for a restaurant that you can walk to in town, have some lunch and cake and hop back on the train for the return trip. Suggested stops? Both Chappaqua and Mount Kisco have pizza parlors located in easy walking distance of both stations! TABLE Local Market is a true ‘local’ market in Bedford Hills featuring fresh produce, sustainably raised meat and poultry, cheese and dairy products from regional farms and producers, as well as specialty products, such as jams, honey, maple syrup, pickles, bread and baked goods. Seasonal prepared meals from local ingredients. TABLE is commited to supporting farmers while providing fair and convenient access to delicious, high quality, healthy food. Let us cater your next party — we can even provide healthy alternatives to hot dogs, chicken fingers and birthday cakes – your kids will never know they are eating healther versions of all of their favorites! Visit www.tablelocalmarket.com.